Will the iPad replace the laptop? No - it'll work alongside it! More uses for the iPad are being found every day. 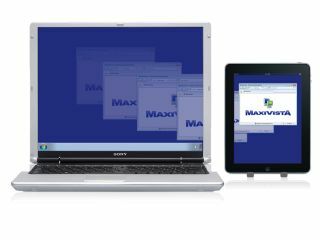 Bartels Media, for example, has created a new app, MaxiVista, that enables PC users to turn it into a wireless second monitor. This could be useful for iPad-owning laptop musicians who require more screen real estate, with Bartels claiming that "MaxiVista offers a display frame rate that, although wireless, closely matches that of a conventional monitor. Due to a special data compression, the CPU and network load stay mostly within single digits." You can see MaxiVista in use in the video above - it costs £5.99 and is available from the iTunes Store. A Mac version is currently in development.